The arch calculator calculates the distance [G] between the focus points [F] and the arch's center [C] (see Elliptical Point Measurements diagram below). This distance is determined based on the arch's height [H] and width [K]. Before using this calculator, you must know the height [H] and the width [K] of the arch that you are wanting to build. These dimensions are determined by you, the designer. Note: This calculator will not allow the height [H] to be greater than or equal to half of the arch's width [K]. If the height [H] of your design is equal to half of the width [K], the result would be a perfect circle. You would not need focus points to layout a circle. Note: Distance [E] is equal to distance [D]. You can use this information to cross-check the location of the focus points when laying out your arch material. For details on how to use these calculations to create the shape of the arch and built it, refer to the How to Build an Archway section. Arches can be an elegant and inexpensive addition to accent an entryway or hallway. They can also be very useful as a transition, where ceiling heights vary between rooms. 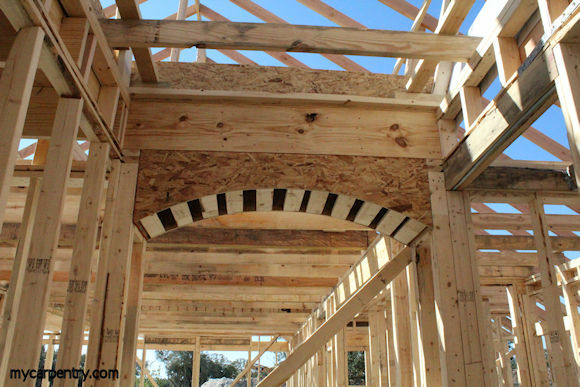 You can build an archway like the one shown in the photo below (in new construction) or you can add it on top of existing finished/painted Sheetrock, if your home is already built. 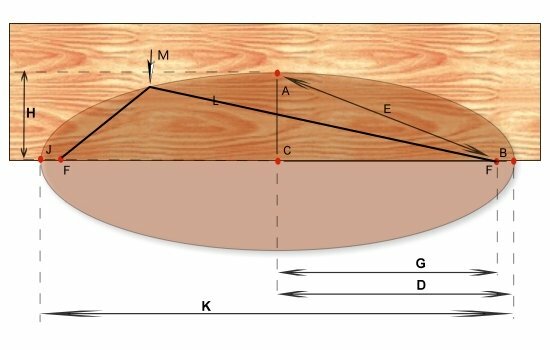 For detailed instructions on how to use the results of this calculator to layout and build an archway, navigate to mycarpentry.com's How to Build an Archway page. If you have any comments or suggestions regarding this carpentry calculator, please don't hesitate to contact us.